Both Spain and Portugal have experienced political instability. 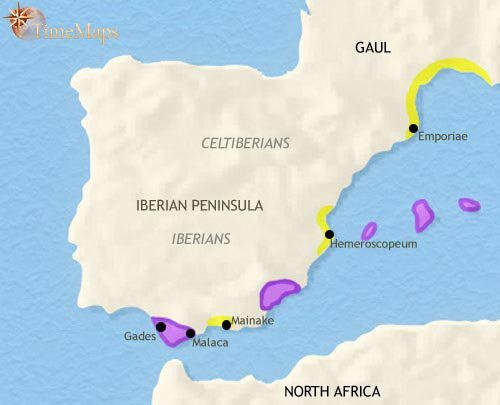 Phoenician and Greek colonies cling to the Spanish coast. Carthaginian and Roman armies have contested much of Spain. Roman armies have slowly conquered most of Spain. 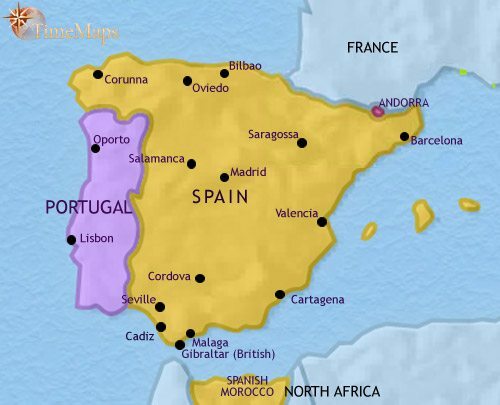 Spain and Portugal have become thoroughly Romanized after centuries of Roman rule. Spain and Portugal have experienced much destruction, but the old Roman civilization endures under Visigothic rule. 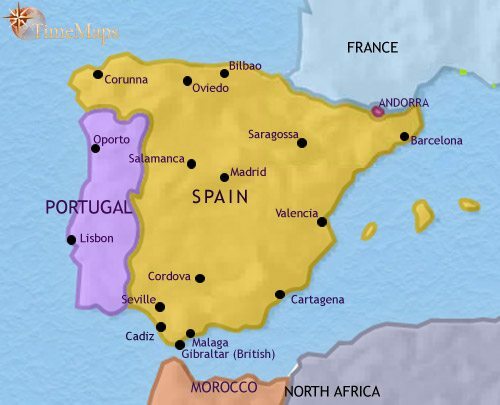 Muslim Spain is the most prosperous region of Western Europe. 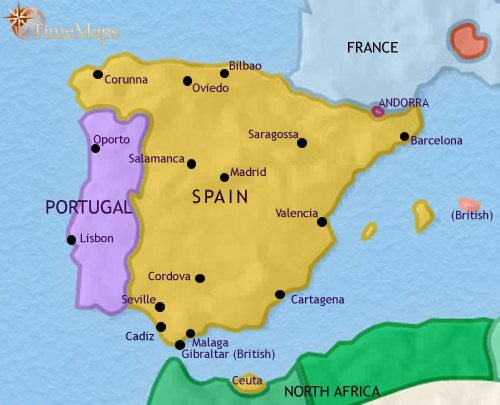 The Christian kingdoms advance as Muslim Spain fragments into many small emirates. 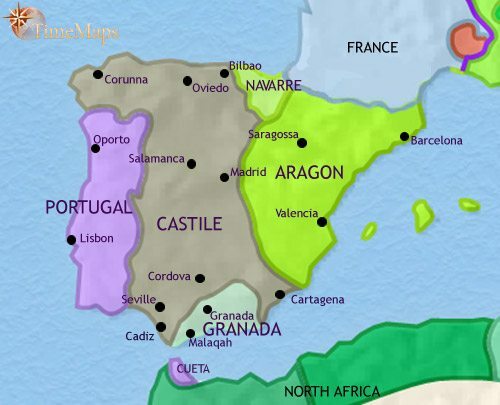 Castile, Aragon and Portugal are now the leading Christian kingdoms of the Peninsula, and the Muslims are confined to the small emirate of Granada. Spain is a united country with a vast overseas empire. Spain has become virtually a satellite of France. Both Spain and Portugal have lost their overseas empires in South America. Portugal is now a republic. Spain and Portugal are ruled by dictatorships. Spain and Portugal have become democracies and members of the EU. Coups, counter-coups and the occasional civil war have continued to characterize Spanish politics for most of the 19th century as conservatives and liberals have fought for control of the government. The monarchy has switched sides with alarming regularity. At this date, power is in the hands of a junta of liberal generals ruling in the name of a constitutional monarch, Amadeus. 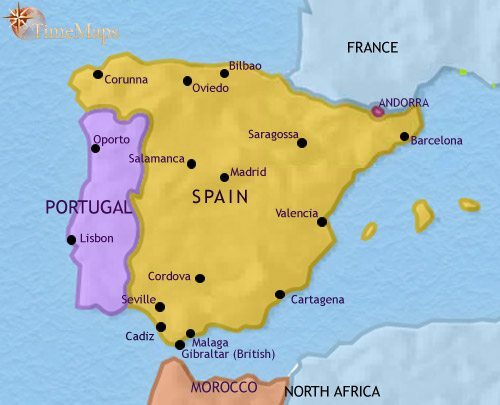 As with Spain, Portugal experienced instability and civil war until intervention from Britain, Spain and France established a constitutional government. Thriving Phoenician trading colonies, which by 500 BCE had come under the control of Carthage, were located on the southern coast of the peninsula. So too were a smaller number of Greek colonies. The influence of these newcomers has led to rise of new semi-urban cultures in southern and eastern Spain. Their large settlements included many elements in building styles and other techniques borrowed from the Greeks and especially the Phoenicians. They had also adapted the writing systems of the Phoenicians and Greeks, and used metal coinage. In the rest of the peninsula, Celtic culture predominated, based on numerous tribes and including the standard hill-top forts of these warlike societies. These also showed influences radiating from the south, but these got steadily weaker towards the north and west. 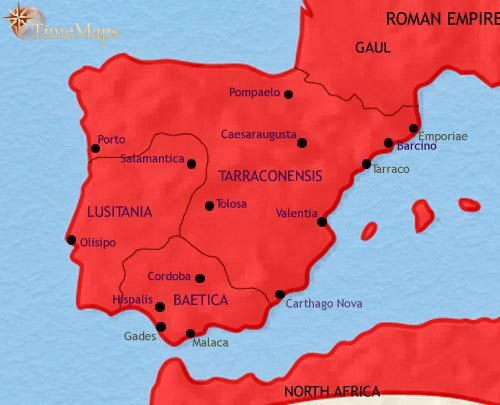 Carthage conquered southern and eastern Spain just after 230 BCE, and it became a virtually private empire of the powerful Carthaginian Barcid family. During the 2nd Punic War this area was one of the main theatres of war, the scene of severe fighting between Roman and Carthaginian armies. After many set backs the Romans won this contest, and this area has therefore passed into the Roman sphere of influence. The first Italian colonies have been planted here. The Iberians and Celts of the centre, north and west retain their independence, but their inter-tribal warfare will drag the reluctant Romans further and further into the peninsula. The Romans have gradually conquered most of present-day Spain and Portugal, in a process which saw significant Roman reverses (one entire army was forced to surrender to an Iberian tribe in 137 BCE), and in which the subjugation of the north-west is not yet fully complete. Eastern and southern Iberia have been under Roman rule for the past two centuries, and are thoroughly integrated into the Roman world. 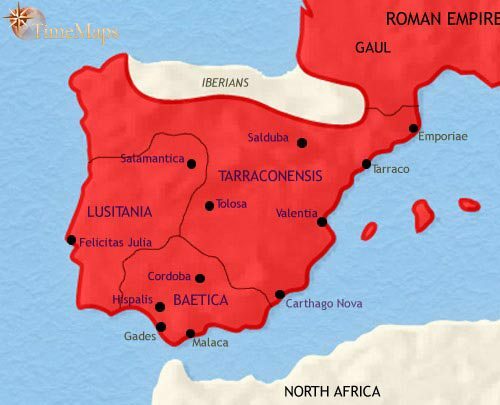 The Iberian provinces were drawn into the Roman civil wars of the first century BC, at one stage being ruled as a virtually independent state by the rebel Roman general, Sertorius (82-72 BCE). Under Julius Caesar and Augustus, thousands of Roman veterans have been settled in Spain. Roman merchants live in the numerous towns of the region, and the mineral wealth of Spain has brought prosperity to many, Italians and natives alike. Many close ties bind the elites of Spain to Italy, and leading members of the Spanish elite have become the first colonials to enter the Roman senate. 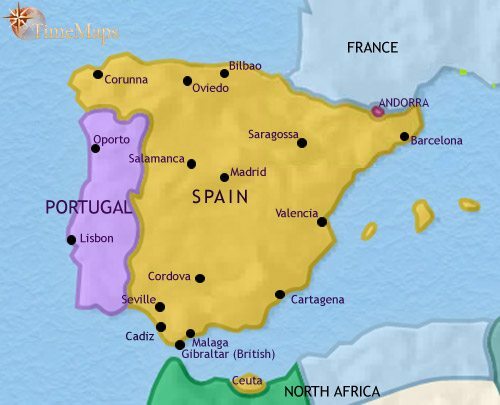 The whole of the Iberian Peninsula is thoroughly Romanized. Full Roman citizenship is common throughout the peninsula, and it is likely that all free inhabitants enjoy at least the Latin citizenship (a type of second-class Roman citizenship). Baetica is one of the most Romanized provinces of the empire, and has contributed many leading senatorial families, including those of the emperors Trajan and Hadrian. Earlier, the famous Roman philosopher Seneca and poet Martial had their origins in Spain. The region is a prosperous part of the imperial economic system, producing metals, wine, olive oil and manufactured goods such as glassware and textiles. 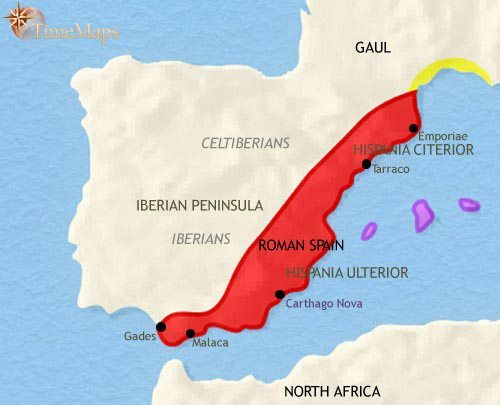 Like most other parts of the Roman world, the Iberian Peninsula suffered from barbarian invasion during the third century despite its distance form the Rhine frontiers. The region then experienced comparative peace during the fourth century. At this time the peninsula seems to have become a leading centre of Christianity. This peace was shattered In the early fifth century, when barbarians swept through the land, causing widespread destruction. 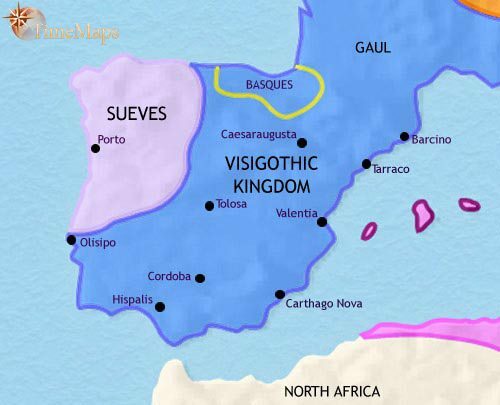 In due course the Suevi and Visigoths consolidated their power there, and by now the Visigoths control most of the peninsula. The Visigoths, being Arian Christians rather than Catholics, maintain a certain distance form the local population. However, they use Hispano-Roman officials to help them run their kingdom. The old towns, though shrunk and damaged, retain much of their importance. As elsewhere in western Europe, the troubled times of the past century has given the Church a position of outstanding leadership amongst the people. An Arab-Berber army crossed from North Africa into Spain in 710 and speedily conquered most of the Iberian peninsula, driving the Visigoth rulers into the northern mountains. Here, the Christians elected a Visigothic lord, Pelayo, as their king and organized themselves into the small kingdom of Asturias. The Basques, meanwhile, asserted their independence and successfully defended it against their neighbours, both Muslim and Christian. 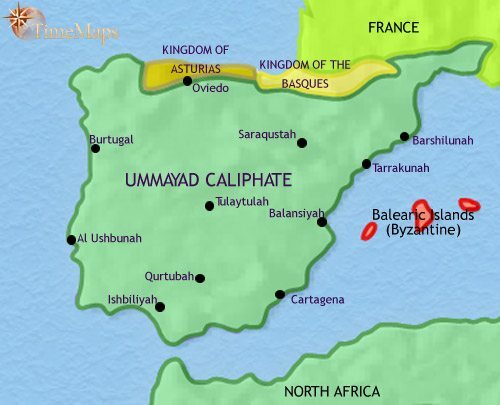 The majority of present-day Spain and Portugal now belong to the vast Muslim Caliphate, ruled from far-off Damascus. The Muslims never seriously attempted a conquest north and east of the Pyrenees, but carried out seasonal raids into Christian France. The famous Frankish victory at Tours was over such a raiding party, not a full-blown Muslim invasion. 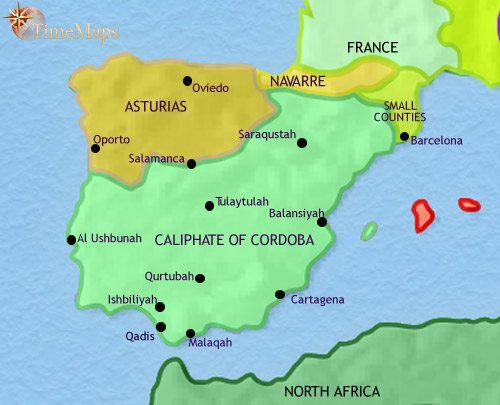 With the replacement of the Ummayad caliphs by the ‘Abbasids in the Middle East, an Ummayad prince fled to Muslim Spain in 756 and, after a civil war, established an independent state here, commonly called the Caliphate of Cordoba (after its capital). This state has experienced great prosperity, and the capital itself has become the largest city in Europe, filled with beautiful palaces and mosques. The Christian kingdom of Asturias was able to take advantage of the civil war in Muslim Spain to seize much additional territory for itself. The kings moved their capital to the newly conquered city of Leon, and style themselves kings of Leon. The Basques have continued to maintain their independence, establishing the kingdom of Navarre. The small counties to its east were originally set up as military border territories by Charlemagne, after his capture of Barcelona from the Arabs in 801. Since the late 9th century the leading county, Catalonia, has been asserting its independence from the Frankish kings. The Muslim Caliphate descended into civil war after 1000, and fragmented into a number of independent emirates. These small states were unable to hold back the Christian tide, and so they invited the Almovarids, an Islamic movement from North Africa, to come to their aid (1080’s). 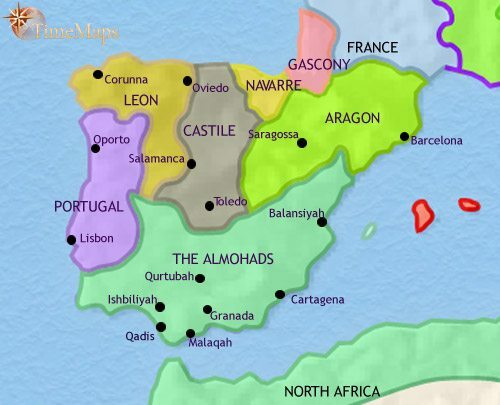 The Almoravids controlled Muslim Spain until the Almohads, another North African Islamic movement, replaced them (1147). The Christian kingdoms experienced a bewildering series of changes in the 11th and 12th centuries, but the dominant theme was the rise of new Christian kingdoms on the borders with the Muslims. 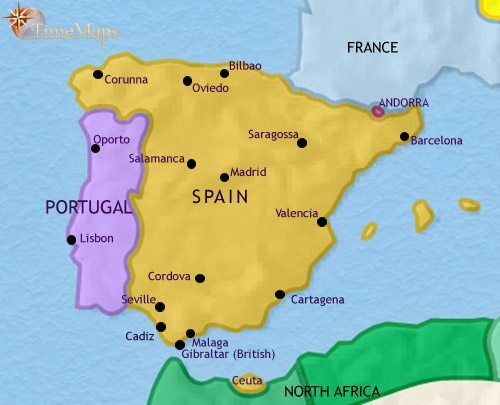 These had their origins as counties which asserted their independence and expanded their borders at the expense of the Muslims, before claiming the status of kingdoms for themselves – Aragon in 1035 (after merging with Catalonia), Castile in 1037 and Portugal in 1139. In 1229 the Almohads abandoned Spain, and Muslim Spain again became divided amongst several small emirates. This allowed the Christian kingdoms to make good progress in their “Reconquesta”, and the Muslims are now confined to one state, Granada. Isolated though it is, Granada, with its court located in the magnificent Alhambra palace, is the centre of a brilliant Islamic culture. 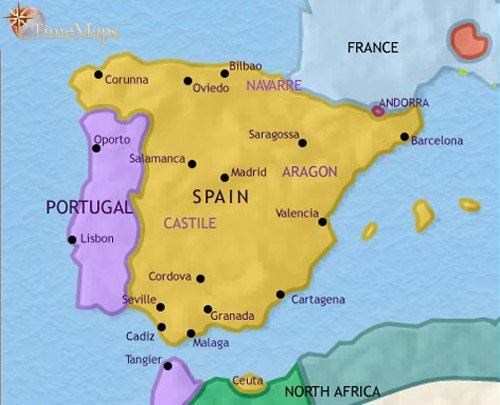 Castile and Aragon are now the leading Christian kingdoms in Spain. Aragon has become a major maritime power in the Mediterranean, having gained control of the Balearic Islands, Sicily and Sardinia. Castile has merged with Leon to become the dominant military power within Spain itself. In both kingdoms, much of their territory has been taken from the Muslims, as is the case also in Portugal. In Portugal, this is the age of Prince Henry the Navigator. Under his guidance, numerous expeditions have been sailing down the west coast of Africa, probing further and further south. Portuguese ships have by now reached the coasts of West Africa. They are laying the foundations to the great age of European exploration, which will eventually transform the entire world. The marriage of Ferdinand of Aragon and Isabella of Castile in 1469 united Spain, and the two monarchs set about creating a strong centralized state. Within a few years the last Muslim state, Granada, had been conquered (1492), and the Spanish government installed the Inquisition to bring about the Christianization of the conquered territory. In 1492 also, Christopher Columbus, sailing in the service of Spain, discovered the New World. In the following decades Spain acquired an enormous new empire in Central and South America, whose gold and silver made her the wealthiest and most powerful nation in Europe. Under king Philip II (1556-98), Spain used this power to champion the Catholic Church against the Protestants. He attempted to put down rebellion in the Netherlands (from 1581) and despatched a huge fleet, the Great Armada (1588), to bring England back into the Catholic fold. He also conquered his smaller neighbour, Portugal. However, his and his successors’ wars failed in their objectives and sapped Spain’s wealth and strength, and she is no longer the leading power in Europe. Portugal has recently regained her independence from her larger neighbour (1640). Spain has had a Bourbon king since 1713, and in many ways has become a satellite of France, at least so far as foreign policy is concerned. The Treaty of Utrecht (1713) granted Gibraltar to Britain, and Spain’s attempts to regain Gibraltar and other losses were defeated by Britain and her allies in 1720. After a period of decline lasting until the mid-18th century, Spain has experienced governmental reform and economic revival. The 18th century has been a period of prosperity for Portugal. The country has enjoyed stable, if autocratic, government and increasing prosperity, boosted by rising wealth from Brazil. However, a catastrophic earthquake all but destroyed Lisbon in 1755. The prompt action of the capable minister, Marquis de Pombal, alleviated the situation and Lisbon was rebuilt as one of the most enchanting capitals in Europe. The Napoleonic Wars were a disaster for Spain, with huge French and Allied armies marching across the land and bitter guerilla warfare engulfing large parts of the Peninsula. At the end of the war, the restored king, Ferdinand VII, abolished a liberal constitution and imposed the old authoritarian monarchy. Since then coups, counter-coups and, on occasion, civil war have characterized Spanish politics. These years have also seen the loss of most of Spain’s empire in South and Central America. Portugal was an ally of Britain’s throughout the Napoleonic Wars, and as a result experienced much devastation from French armies. In 1807 the British navy whisked the court and royal family away to the Portuguese colony of Brazil, to keep them from falling into the hands of the French. They did not return for several years after the war. Since the wars, the country has experienced instability and civil war, not helped by the absence of the king and royal family in Brazil. After the royal family had returned, Brazil became independent from Portugal under a separate branch of the Portuguese royal family (1822). In Spain, a republic was declared in 1873, but the situation quickly deteriorated into regional rebellion. A military coup the following year restored the monarchy in the person of Alfonso XII (reigned 1874-85) and Alfonso XIII (from 1886), whose popularity have given Spain a stretch of political stability and economic growth. Overseas, however, the Spanish have lost the last of their colonies in Latin America – Cuba and Puerto Rico – as well as the Philippines, in a short, sharp war with the USA (1898). In Portugal, growing factionalism at the royal court has led to the overthrow of the monarchy in 1910, and the setting up of a republic. Overseas, Portugal has extended its rule into the interior of the African territories of Angola and Mozambique. Spain remained neutral during World War 1. In 1923, the General Primo de Rivera carried out a coup d’etat and became dictator. Rivera did much to promote Spain’s economy, but opposition to him grew, and he resigned in 1930. King Alfonso III had been discredited by his support for Rivera, and he abdicated in 1931. Spain declared itself a republic, which was controlled by the left-wing Republicans. They aroused the bitter hostility of the powerful conservative forces in the country, and in 1936 a bitter civil war between left and right erupted. By March, 1939 General Francisco Franco, the leader of the right wing Fascists, had won, and has since been dictator of the country. He kept Spain neutral during World War 2, but after the war she joined NATO. Portugal, meanwhile, had been an ally of Britain, France and Russia (and later the USA) during World War 1. In the years, after the war political and economic conditions deteriorated until Dr Salazar was appointed finance minister in 1926. He seized power as dictator in 1932, and has remained in power ever since. Portugal remained neutral in World War 2, but joined NATO after the war, in 1949. During the 1950’s, some progress was made in modernizing Portugal’s agriculture and industry. In Spain, Franco dies in 1975, and the monarchy was restored in the person of king Juan Carlos (1975). Under his guidance multi-party democracy has become firmly established. In March, 2004, Spain suffered one of the deadliest terrorist attacks the world has seen, as commuter trains in Madrid were bombed. Portugal’s dictator Dr Salazar resigned in 1968, but authoritarian rule did not give way to a multi-party democracy until 1976. Meanwhile, Portugal’s position as the last major European colonial power in Africa had become increasingly untenable, and the process of withdrawal from Angola and Mozambique was hurriedly carried out in 1974, leaving both countries unprepared for independence and sliding into chaos. Spain’s economy in particular has experienced remarkable expansion and modernization. Both countries have benefited from mass tourism, mainly from northern Europe. Both Spain and Portugal joined the EU in 1986.